You knew this was coming, because you have a sick sense of humor and are a regular on this website. 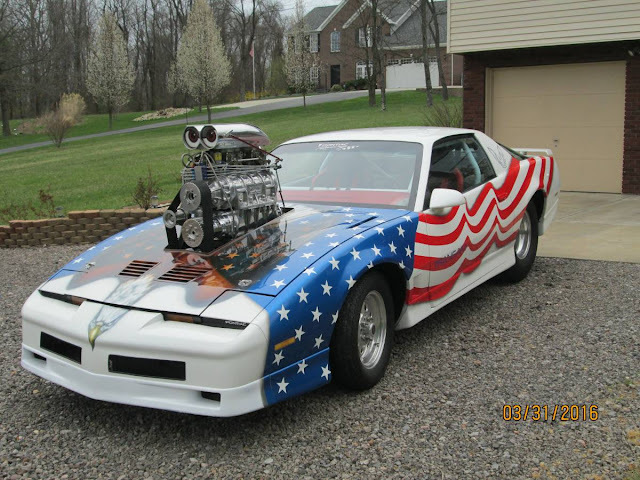 With any luck you've been piling up the good stuff and saving the links to the BESTEST 'Murican cars around the interwebs. Beat this 1985 Pontiac Firebird with a 400 cubic inch V8 and twin stacked superchargers offered for $19,000 in Reno, NV. Poking up through the American eagle decorated hood is the double cheeseburger of forced induction, but alas the second supercharger is a tofu bugeresq empty box for show...but at least it breaths through two functioning 4-bbl 750 CFM carbs. Find something more 4th of July ready? Paste it in the comments below. 'Cause nothin' says 'murican like Vietnam !! Car owned by a PATRIOT! How about a Lexington Minute Man Six? weirdness with image posting... i used the code as below but accidentally left off the final "/" and it wouldn't show - then i posted it again *with* the / and *both* showed - so i deleted the second one and the first one wouldn't show again - then posted again with the / and both showed - i'll just stop right there - anyone know wth? Oh. Wait. Didn't they have a British flag on their car? Re the featured car: I'm sorry, but what the hell is that mess? Cage is designed to be absolutely useless in a roll over, except to concuss the occupants. Belts are "mounted" on the seat bar to look like real racing setup but are actually passenger OEM seatbelts. NOS bottle is "MT" and the light is for show. Blower is for show. Valve pan and plug set up...for show. Oh wait...this was for the Most What's The Worst of America Car! Loud and boastful with a dearth of actual substance within?? I may have woken up on the wrong side of the bed today. It's OK doctordel... we all have days like that. Y'all a bunch of Commies.... What's more 'Merican than "all hat, no cattle"? Ask D.J Trump! >> Full 10 Point Rollcage (side door sections were removed, but available to reinstall). I only seem to be able to locate 4 points, and it seems entirely plausible that two of them are tied into the amp. Do you supposed he plays "real" Hemi sounds on the stereo while driving it? Oh wait, no...apparently it only plays alternator noise.